Letting go is all Ronan's ever known. he should hold onto at any cost? 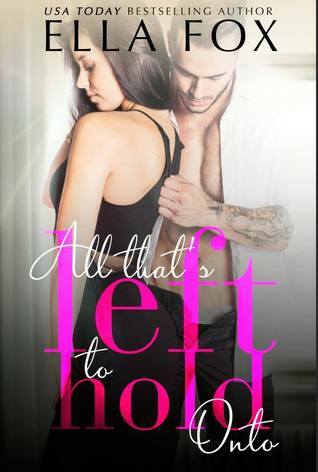 Find out in All That’s Left to Hold Onto by Ella Fox! There were nasty looking bruises on his cheek and jaw, his lip was swollen and his knuckles were scraped and bloody. The instant I got a good look at his face I knew something was horribly wrong. It only went downhill from there. The anger was all but pouring off of him. Not toward me—he’d never once been angry with me. I knew anger though, and it was more than obvious he was furious about something. A permanent grimace seemed to have set up camp on his face. For him, it was highly unusual. Even in the toughest of times, he kept his cool. Suddenly, he wasn't calm at all. He was angrier than I’d ever seen him. It was obvious he’d been in a fight, but it didn’t change his status as the most attractive guy alive, in my opinion. I saw his jaw clenching and unclenching which I figured meant he was trying to control himself. I didn’t know how to argue with his words. He wasn’t wrong—there was a lot wrong with many of the people in our town. Most of the crazy people were either my family members or his. I knew it and so did he. There wasn’t a response to erase the reality of the kind of people we dealt with. His hand shot up into a stop gesture to keep me from finishing the sentence. I couldn’t stand her so it wasn’t like I was going to push. She was an evil troll. If he had to go, I was glad he wasn’t taking her with him. It would’ve made me ill. She pretended to be sweetness and light when he was around but it was nothing but a charade. She was terrible. I was glad he wasn’t taking her, but the fact he wouldn’t say her name told me his leaving was somehow her responsibility. I hated her more than ever. He gestured back over his shoulder toward the street with his thumb. “Wherever my car takes me once I pull out,” he said. I couldn’t imagine life without him, nor did I want to. Not only had he been my crush for as long as I could remember, he was the only person who ever really listened to me. “Will you ever visit?” I asked hopefully. He was shaking his head in the negative before I’d even fully finished asking the question. I knew he wouldn’t. The bone-deep hatred he had for everything about where we lived was stamped all over his face. I wanted so badly to know what, exactly, had sent him over the edge, but when I asked, he’d refused to tell me. It sucked being fourteen because he treated me like a kid. My age said I was a child, but I was so different than any of my peers it wasn’t even funny. Because of this, they teased me often, referring to me as Granny Carmichael. I hated it. It wasn’t as though I’d had a choice. My childhood was over the moment my mother got sick. The frigid Colorado air wasn’t even making an impression on me until he pointed it out. I realized my tears were leaving cold trails on my face, but I couldn’t walk away. All I cared about was how much I didn’t want him to leave. “I don’t care about the cold or getting pneumonia. I don’t want you to go!” I cried anxiously. He hugged me then, his strong arms wrapping around me to give comfort. I hadn’t hugged him since I’d been much younger—probably five or six. Those hugs had mostly involved me wrapping myself around one of his legs. This was different. I wrapped my arms tight around him and cried against his chest, holding on for as long as he allowed me to. Knowing my denial and resistance weren’t going to make any difference, I swiped at my tears as I nodded. My heart galloped in my chest. I loved him for saying what he did—but hated that it came at such a horrible price. Losing him was unbearable. He turned as if to leave, then stopped. Spinning back my way, he stared at me intently for a few moments before he spoke again. I nodded as I wiped at the tears running unchecked down my face. He hugged me again, very briefly. My heart skipped a few beats when he dropped a kiss on top of my head. “Don’t ever forget your worth—not even for a minute,” he murmured. When he let go, he said nothing else. He just turned and walked to his car. As he went, the chill in the air suddenly took hold of me. Hugging my arms around myself, I watched as he got into the car, turned it on and then pulled out of my driveway. He looked at me one last time before putting his hand up in a goodbye gesture. I did the same. A few seconds passed before he put the car in drive then sped off into the night. I stayed outside for two or three minutes, hoping against hope he would change his mind and come back. Hours later when I got into bed, I prayed fate would bring him back one day. I said the same prayer most nights for a long, long time. Eventually I had no choice but to accept reality. Hell would freeze over before he returned.